Once, Megalopolis was a shining beacon of hope - home to many of the world's greatest superheroes. Fleet. Southern Belle. Tom-O-Hawk. The Red Flame. And the mightiest of them all - Overlord, The Man Of Granite! All of them called Megalopolis home and Megalopolis was rightly called the safest city in the world. That was then. Now, nobody in Megalopolis is safe. Something has cause the most powerful beings on Earth to go mad. And as a Congressional sub-committee seeks a scapegoat for the disaster, the dwindling civilian population of Megalopolis must find a way to survive... or a way out. 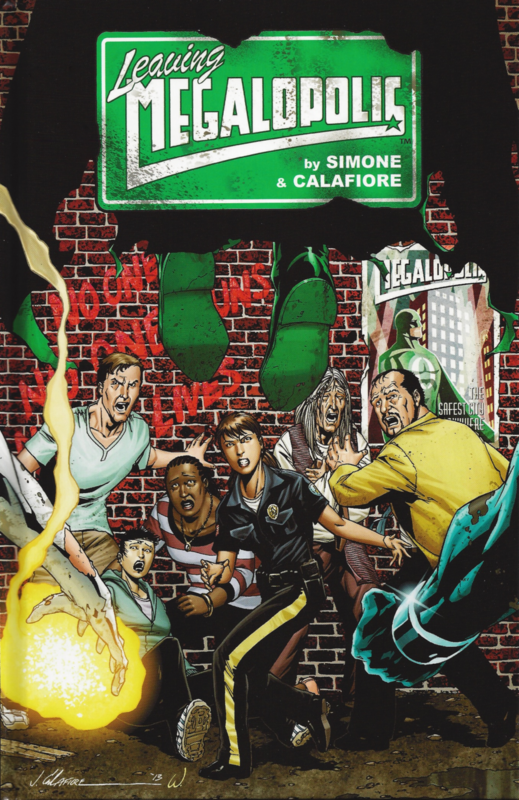 Leaving Megalopolis is quite easily the most twisted thing Gail Simone has ever written. It is also one of the best things she has ever written and easily the best "superbeings as the monster" story written in recent memory. I think this is because it is the first story of this kind to truly examine the horror of being without power in a world full of mad gods. Even Mark Waid's excellent Irredeemable was more concerned with deconstructing the Superman than in analyzing the human factor. Simone keeps the focus purely upon her small group of survivors and I think this series is the better one for that reason. The connections the reader makes to the characters is much stronger, for most of us can sympathize with the idea of feeling powerless in a bad situation - albeit ones less fantastic than being hunted by an army of superhumans! The artwork is equally excellent, detailed without being muddied. Artist Jim Calafiore is a tremendous visual choreographer. The action of the issue is clearly depicted and Calafiore's character designs are distinct and memorable, leaving no doubt who each character is despite a large and varied cast. Colorist Jason Wright and letterer Dave Sharpe also add their talents to the final product, as they did on Secret Six. Alas, as amazing as this book is, you'll probably never get a chance to read it. At the time of this writing, the plans are for this book to only be offered to those who funded it during its original Kickstarter campaign. And yet, there is hope. For the hardcover edition does feature a "1" on it's spine. Does this mean there is a chance of Volume 2 in the future and perhaps a second printing of volume 1 for those who sponsor a future Kickstarter? Anything is possible. Regardless, I highly recommend this book and suggest you make offers of cash, first-born children and sexual favors to ensure your chance to read it.